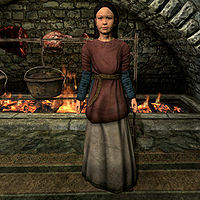 Dagny is a Nord child who lives in Dragonsreach. She is the daughter of Jarl Balgruuf the Greater, and sister of Frothar and Nelkir. She can often be found wandering the main hall of Dragonsreach and sitting at either of the dining tables. She wears red child's clothes and a pair of shoes. She carries a selection of food and toys, and a small amount of gold. It becomes apparent that Dagny does not think very highly of the city of Whiterun when she remarks, "Absurd that you can't get good sweet rolls in this skeeverhole of a city." At other times, when you pass her by, she will tell you, "One of the new servants? Remember that I like my meat rare." She can sometimes be found complaining that her new dress has not arrived yet with comments such as "Blasted war. I was due a new dress from Solitude, but it will never get here." and "Father promised me a new dress days ago, now where is it?" If you've captured Odahviing and approach her, she'll will say, "Father won't let me go see the dragon." Dagny: "I'm so angry, I can hardly stand it! Father promised me a new dress days ago, now where is it?" Frothar: "It takes a while to make a dress, Dagny. You have to be patient." Dagny: "But I don't want to be patient! I want my dress right now! Father promised!" Frothar: "All you ever do is complain about what you want. You're a spoiled baby." Dagny: "I'm going to tell father you said that. He'll tan your hide for sure!" One of Dagny's lines ("Where is papa? I want to ride Karinda now!") indicates that Dagny was supposed to have a pet horse named Karinda, but it does not appear in game. If Whiterun is conquered by the Stormcloaks, then Dagny's father will move to the Blue Palace but she will not. Also, her dialogue will not change. This issue has been addressed by version 1.2.2 of the Unofficial Skyrim Patch; she will move to the Blue Palace.